Valid on select departure only. Single supplement discount not combinable with any other single supplement discounts including MPC and Chairman's Club. Offer is combinable with the 5% MPC and Chairman’s Club discount. Offer subject to availability and may be withdrawn at any time. Valid on selected dates only. Offer subject to availability and may be withdrawn at any time. Prepare to be enchanted on this epic journey to the heart of the ancient Inca Empire. See why Machu Picchu features on every traveller’s bucket list and explore it away from the crowds. Soak up the dazzling colours of Peru’s textiles and handicrafts and savour the fresh and flavoursome cuisine which has become one of the world’s most fashionable. Contrast 4,000 years of pre-Columbian history at the impressive Larco Museum with the vestiges of Spanish colonial rule in Lima’s grand squares and Cusco’s cathedrals and see how the conquistadors lived with private access to a grand 16th century residence. Visit an inspiring project giving hope to impoverished, at-risk children in the Sacred Valley and admire the breathtaking countryside as you travel to Machu Picchu by luxury rail. After a welcome briefing, enjoy an interactive Chef’s Table culinary experience where your chef deftly demonstrates and you assist in the preparation of a variety of Peruvian dishes. After lunch, explore Peru’s capital, visiting the Plaza Mayor, which is the birthplace of the city of Lima, and the beautiful Cathedral, built in the 16th century. Next, visit Casa Aliaga, Lima’s oldest colonial mansion. Built in 1535 by the illustrious Spanish conquistador Jeronimo de Aliaga, this incredible relic of colonial splendour has been home to 17 generations of his descendants ever since. Note the grace of the wood and marble staircase leading up to a fine entrance patio. View its beautiful rooms; the family chapel; the Golden Salon with incredible golden mirrors; and a beautiful upper gallery, which is home to some important paintings from the Cusco School. Spend time exploring the Larco Museum, one of the city’s best museums for pre-Columbian artiefacts. Then, enjoy a welcome dinner at the on-site restaurant. This morning, fly to Cusco (3,350m). Enjoy lunch in the central square before proceeding to the Sacred Valley of the Incas, where an ancient way of life lives on. En route, visit Awana Kancha, a centre where South American camelids, such as llamas and alpacas, are bred. Learn about the valuable fibres created from their coats, and feed these iconic animals. Continue and check in to your relaxing accommodations — a charming Andean-style casita set amid gardens of flowers. Enjoy the rest of the evening at leisure and dine at your hotel restaurant. When school is in session, visit the Kuychi Center to meet the underprivileged children at Niños del Arco Iris (Children of the Rainbow), a project supported by A&K Philanthropy. Explore the Sacred Valley of the Incas with a visit to a remote village seemingly frozen in time. Experience complete cultural immersion as you delve into the ancient agricultural methods they have used for centuries to support themselves in this challenging Andean mountain environment. Enjoy lunch locally before returning to your lodge. Spend your afternoon at leisure, enjoying the amenities of your accommodations and dine tonight at the restaurant on site. Prepare for your visit to Machu Picchu with a private, interactive lecture from a renowned scholar and certified expert on the Incan ruins. Briefly visit Ollantaytambo Fortress, a formidable structure of massive stone terraces that hug the mountain slopes — and the site of the Incas’ greatest victory over the invading Spanish. 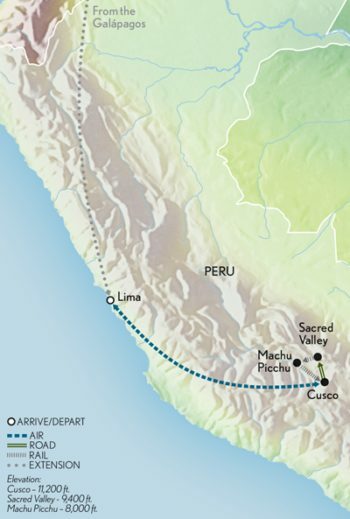 Next, journey deep into the Andes toward Machu Picchu on board the PeruRail Sacred Valley, a train inspired by the elegance of the 1920s, which is reflected in both its Dining and Observatory Bar Cars, gazing out at the spectacular Peruvian countryside. Arrive to begin a thrilling overnight stay at the only hotel located on site at Machu Picchu, exploring the breathtaking Incan city from sunrise to sunset. Overlooking the Urubamba River and discovered in a hidden tangle of trees atop a mountain by American historian Hiram Bingham in 1911, Machu Picchu forever holds the secret of its passing — its Incan inhabitants left no written records of its purpose. Built in the 15th century at the height of the Inca empire, it was most likely the estate of an emperor. Curiously, excavations here have revealed skeletons, artefacts and woollen clothing, but no gold. Tour the ruins with your expert guide, and then enjoy exploring on your own. You may view the Temple of the Sun or Intihuatana, a ritual stone that may have been an astronomical clock or calendar. As you wander, sense the majesty of the age-old stone walls and picture life as it might have been for the leaders, warriors, priests and craftsman who once inhabited this Incan citadel some 8,000 feet above sea level. Tonight, rest easy in your accommodations, designed to echo the soaring natural surroundings. Rise with the sun to walk through Machu Picchu in the early morning mist before the crowds arrive, for an experience some consider the spiritual highlight of the journey. You may opt for a hike to Inti Punku (Sun Gate), the entry point to the ruins from the Inca Trail, or trek up to Huayna Picchu, the high mountain that forms the backbone of the ruins, to enjoy spectacular views of the surrounding area. After your explorations, bid adieu to this ‘Lost City of the Incas’ and board the Vistadome train to Ollantaytambo. Continue to Cusco where you check in to your hotel, once a 16th-century monastery. Discover Cusco on a city tour that includes the Cathedral on the Plaza de Armas and the Santo Domingo Temple, a Dominican church built on the foundations of the Koricancha, the Incas’ principal religious building. Later, explore the well-preserved ruins of Sacsayhuaman, a testament to Incan architectural skill. Compiled of massive stones, the largest of which may weigh as much as 200 tonnes, the walls were constructed with incredible precision and without a single drop of mortar to hold them in place. This ancient fortress, which witnessed the greatest battle between the Spanish and the Incas, overlooks the red-tiled rooves of Cusco. Visit San Pedro market, and then spend your afternoon at leisure. This evening, enjoy an Andean music presentation and learn the history and stories of a wide array of handmade musical instruments. Afterwards, gather for a farewell dinner at the elegant MAP Café. Morning at leisure before flying back to Lima, where you are assisted with onward flight connections. Last group event: airport assistance in Lima upon return from Cusco on Day 8. 04 May 2019 departure will operate on a modified itinerary, Tambo del Inka instead of Sol y Luna.